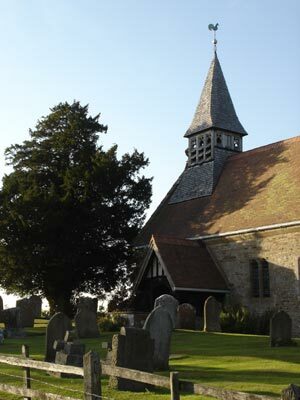 The original church was built in the late 11th or 12th Centuries on Anglo-Saxon foundations. Most of the original structure survives. An unmarked grave was found under the alter containing two bodies lying north and south, side by side and apparently holding hands, with no sign of a coffin. Before the bell turret was build in 1879, the bells were hung on a pole in the yew tree at the west end. It is these bells that still ring out every Sunday mornig. The five windows were made in the 19th Century Birmingham factory of artist, William Morris. The figure of Christ is by Henry Dearle, all the others by Burne-Jones.